To avoid confusion and wasted time by receiving incorrect replies please post your questions about Series MMs under this section. When exactly did the MMs get the coachline under the rear windscreen? as I'm buying what I am told it a 51MM lowlight but the guy selling it has a 51 MM tourer which he says is older then the lowlight, bit confusing really! Do you mean the moulded section below the roof panel were the boot joins? Ive looked at quite a few and it doesnt seem to mention it in any of the minor history books. 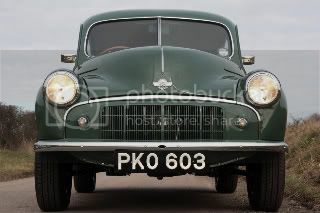 The earliest Ive spotted was September 1950 and that was an British assembled car. Is it a CKD built in another country as these could have been waiting to be built after the normal production ones. Does it have a joint accross the bulkhead? up until c6/58 - had separate body codes too. Change of the wiper motor plinth not mentioned either. Does the vehicle have a body number? me them - along with their chassis nos. - I'll have a go. Can you tell me where I could get a water pump for my 918 cc sidevalve. Urgent. Are you referring to the water pump for the USHM3 engine with the alloy water jacket and thermostat housing? Try MMOC Club Spares. The engine will run perfectly well without the water pump. FrankM83 wrote: When exactly did the MMs get the coachline under the rear windscreen? as I'm buying what I am told it a 51MM lowlight but the guy selling it has a 51 MM tourer which he says is older then the lowlight, bit confusing really! Didn't the lowlights end production in 1950? I have a 1951 mm and she is a raised headlight. Hi Mike I have been given your name on the forum as someone who can tell me what we have bought..
Log book says it was registered on 1st January 1953... I wonder which is is, I don't mind to be honest but I would love to know how to tell if you can help, happy to send you pics or whatever we need to find out, I know it doesn't have a floor chassis number as the whole floor was replaced. Hi, can anyone tell me if the inner choke cable on a MM Highlight is a single wire or stranded wires. Re my post requesting an Exhaust System for a 1951 4door MM or just the front pipe. Can the club put any pressure on the suppliers to make a mild steel system or produce the stainless steel in sections in orderto reduce the high costs involved. Failing that does anybody know who the manufacturers of the sytems are. The cost is in the 'setting up' of the machinery and the calcs required to make the part, hence I make my own. I am sure that they used to come in sections so that the part that was rusted / blown could, on its own, be replaced rather than an entire system. This would also help in heat bending sections where necessary esp going from the engine to the underside of the car where almost every exhaust I have fitted in recent years has fouled.. Much easier to put a 3' section in a vice. heat and bend a few degrees than 8' of exhaust. I had it in my head, for some reason that the exhaust was the same as the later cars with the exception of the front pipe?